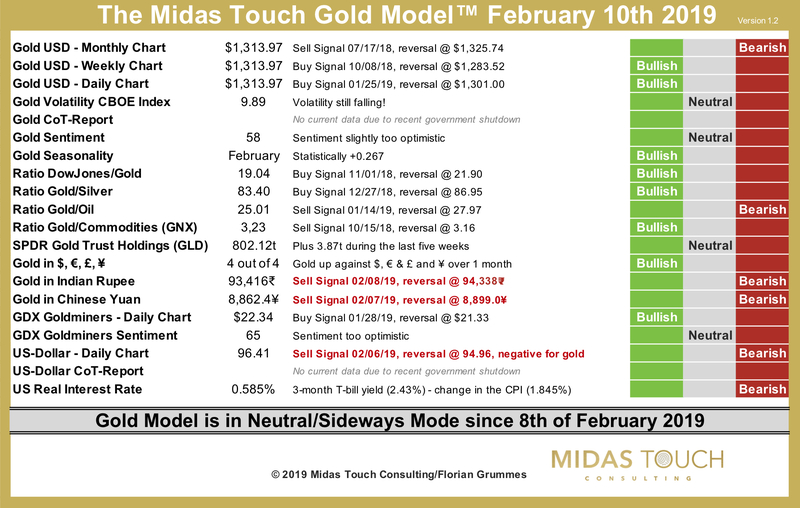 The Midas Touch Gold Model™ – now in neutral mode! On January 25th 2019, gold finally managed to climb back above the psychological round number resistance at 1,300 USD. This bullish price action was followed by four more bullish days. Consequently, gold reached 1,325 USD on January 31st. Since then gold has been consolidating and pulled back to 1,302 USD without losing its general bullish character. Looking at the weekly close at 1,313 USD, it seems as if gold is now on the way towards 1,350 USD. Judging the bigger picture and gold’s encouraging rally since mid of November, I believe, that chances are indeed pretty high for gold to spike towards around 1,350 USD (target zone 1,345 – 1,365 USD) over the next couple of weeks. But while my personal perception certainly is interesting, here at Midas Touch Consulting we have our unique rational and quantitive approach to look at the complex gold market. Our method, the Midas Touch Gold Model™ has turned bullish around the lows in mid of November at 1,200 USD. The model remained in strong bull mode since then and confirmed the rally over the last three months again and again. Important sell signals during the last two trading days! Now, and this may come to your surprise, the model has moved into a neutral conclusion over the last two trading days! The main reason are new sell signals for gold priced in Indian Rupee and Chinese Yuan. As well, the new buy signal for the US-Dollar on its daily chart is shifting the short-term odds to a neutral stance. 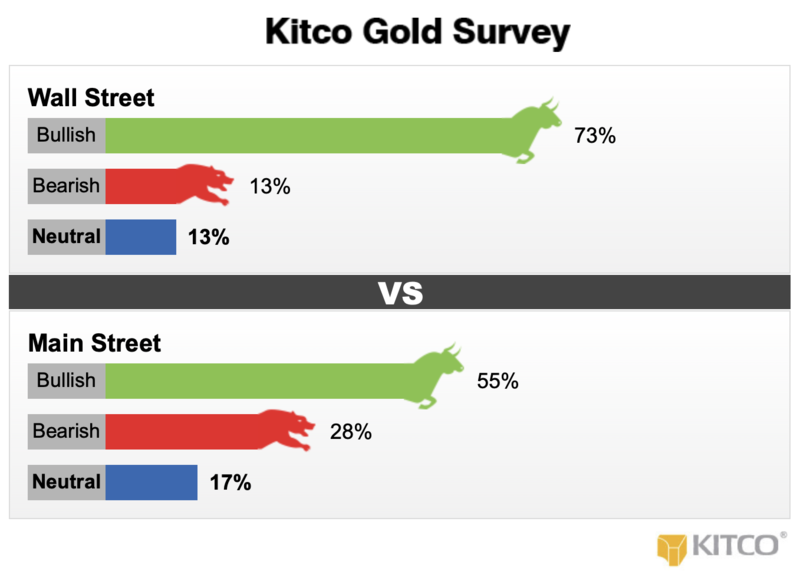 Please note, that the current model is missing the weekly Commitments of Traders Report (COT) which is not published due to the recent government shutdown in the U.S..
Another warning signal comes from the very one-sided and overly bullish “Kitco Gold Survey”. I have been following this survey for many many years. Of course, the lesson has always been the same. Once everybody is writing about gold and everybody is bullish about gold you should better think twice and act rationally! Yes, gold had a good and sustainable run. Yes, the buy signal against stock-markets (e.g. DowJones/Gold Ratio) is very positive and promising. And yes, you need physical gold as a hedge. But very short-term it looks as if gold needs more time to consolidate the recent move above 1,300 USD. Otherwise, the final exaggeration phase starts now! In that case, gold should start a very fast and furious overshot to the upside with a spike to around 1,350 USD in the next few days. Such a parabolic run would mean the final exaggeration of this multi-month rally. Remember, that the last 5 percent of any move are always the most dangerous ones. And especially gold has the character to abruptly turn around. Gold is still in a strong uptrend and has good chances to reach the massive horizontal resistance around 1,350 USD over next few weeks. Short-term gold might need some more time before it will be ready for the final leg up within this rally. But realistically gold will not be able to break through 1,350 – 1,375 USD this spring. Instead, gold will need a multi-week more likely a multi-month pullback below 1,300 USD first. This will probably start in April or May and should bring a new buying opportunity towards July or August. Even though it might seem unbelievable, but with a stop of just 25 USD you could have ridden this rally up to this point. Consequently, I would judge any move below 1,297 USD as an increasing confirmation that the rally that started in August 2018 is coming to an end. Now is not the time to be brave in the precious metals sector. Instead tighten your stops and start taking some speculative money off the table.